Two of the most difficult things for new divers to understand and master are buoyancy and trim. But with just a little knowledge, experimentation and some practice these “skills” are easy to master. When you first start diving you might not have your own gear so your weights might be something you need to adjust before every dive. Another one of the many advantages to owning your own gear is that once you’ve got your weight dialed in you can pretty much leave it there unless of course you change to a different exposure suit or cylinder. Listed below is a general guide to be used as a starting point for those who have absolutely no idea how much weight they will need for a dive in salt water. Take a few pounds off if you will be diving in fresh water. Also, take into consideration that this chart is for a reasonably fit average sized male specimen! The more neoprene you wrap yourself up in the more weight you will need so if you have a XXXL wetsuit you can plan on adding an extra 6 to 8 pounds to these numbers. This works in the opposite direction as well. Remember we are using this as a starting point, you will need to bend and adjust as necessary. OK, so suit up and get in the water. With some air in your BCD (positively buoyant) swim out to where you can’t touch the bottom. Put your regulator in your mouth and take a deep breath. Let all the air out of your BCD. Try and stay in a vertical position, feet directly below you. You should (hopefully) start to sink a little. You didn’t exhale yet did you? You should be letting the air out of the BCD and holding that breath of air in your lungs. If you sink a little bit (to eye level or so) then when you exhale you should slowly start to sink to the bottom. The perfect scenario is while holding that breath of air you can only sink to eye level, then when you exhale the air from your lungs you slowly sink. It helps to relax while doing this. No flailing around. Keep your arms and legs quiet. Any kicking motion or sculling with the hands will make you rise up towards the surface. Through trial and error (adding or subtracting weight) this is the scenario you want to create. Once you’ve weighted yourself so you float at eye level with an empty BCD while holding a full breath of air in your lungs you’ll need to add around another 4 or 5 pounds. WHY? Because you are doing this at the beginning of your dive. 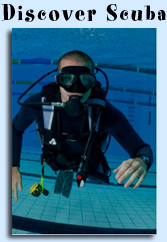 As you use the air in your tank during the dive the tank becomes lighter. At the end of the dive you should be able to make a safety stop (if needed). You will need that extra weight to make up for the weight of the air that was in your tank at the beginning of the dive. So now that you’re weighted perfectly you can enjoy using less air during your dive (and more bottom time) because you no longer carry an extra load of unneeded weight. What’s all this about trim? Well, once you’ve got your buoyancy all figured out you’ll want to start working on your trim. Where you position your weights will have a lot to do with how efficiently you move through the water. You want to strive for being as streamlined as possible which means creating the least amount of drag, look at the illustrations below to get a sense of what good and bad trim look like. Keep in mind in certain scenarios you may want to swim with your fins high so they don’t disturb the bottom (silty dive sites etc…). The diver in the middle looks like a typical new diver who is wearing too much weight and wearing it too low around the waist. Diver three is swimming through the water in a nice streamlined position. 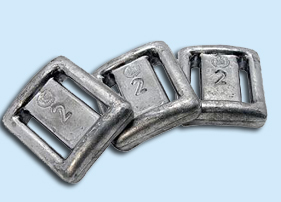 The goal (in most situations) is to distribute your weights in a manner that will allow you to swim through the water in a streamlined position, paralell to the bottom. Streamlining yourself will make it easier to move through the water and you’ll use less air. Weight integrated BC’s usually have 4 pockets for adding weight. One pocket low on each side for “ditchable” weight. This is where you’ll put the bulk of your weight. The other 2 pockets are usually located high on the rear of the BCD above the tank band. These two pockets are for non-ditchable trim weight (usually a max of 5LB’s per pocket). If you don’t have a weight integrated BCD with adjustable shoulder straps which make it easy to move your weight higher or lower on your body there are other ways to go about trimming yourself out. Wearing your weightbelt a little higher or lower will have an effect on your trim. Sometimes this is difficult with a standard weightbelt. The “Weight & Trim System” by DUI is an adjustable pocket loaded weight harness that allows weight to be ditched in an emergency but also is fully adjustable up and down the length of a divers torso. If you have a problem with your feet floating up and don’t want to invest a lot of money for a new BCD or weight system a pair of ankle weights will usually fix the problem. Ankle weights can also be used around the tank neck below the valve for offsetting “feet too Low” problems. Various pockets are also available for adding trim weight to the tank band on most BCDS. Our buoyancy adventure dive is a great place to start working on your weighting and trim. Check out our training dives page for the dates that we are running this dive. Once you’ve mastered your buoyancy, weighting and trim your time spent underwater will seem effortless and you’ll have that much more fun!